Edward James Du Val was born on 14 August 1838, the second son of Charles Allen Du Val and his wife formerly Elizabeth Renney, and was baptised in Manchester Collegiate Church (later the Cathedral) on 31 October 1838. He married Emma Gaskill on 14 January 1864 in Manchester Cathedral, and they had a daughter Edith Du Val born in 1867. Edward James Du Val was a landscape painter. He exhibited at the Royal Academy and the Royal Manchester Institution, and his work was shown in the Manchester gallery of Thomas Agnew alongside more famous artists such as Samuel Bough and Henry Clarence Waite (1). 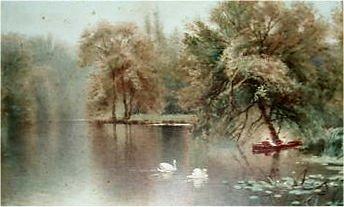 He specialised in landscape paintings, mostly water-colours, often of river or lake scenery. He travelled widely to find suitable subjects and, when found, would paint several of the same scene with only minor differences. He exhibited paintings of views in the Lake District, Wales, Devon, Scotland, Oxfordshire and elsewhere. 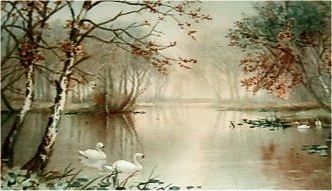 His pictures of rivers or lakes often include one or more swans. At the time of the 1861 Census Edward James Du Val was employed as a clerk in a shipping house. He became a wine merchant, and probably traded with his half-brother William Renney 1833-1874 as Renney, Duval & Co. at 6 Hopwood Avenue near the Market Place in Manchester (2). In the 1881 Manchester Directory he is listed at 27 Blackfriars Street as an artist, where he also traded as E.J. Du Val & Co. as “chemical agents and drysalters”, presumably dealing primarily in artists’ supplies (3). His home address however was in Southport, Lancashire, at 247 Lord Street, North Meols. His widowed mother was living with him there when she died in 1879. The latter part of his life was spent in the South of England. In 1900 Edith married Francis Sellicks, a schoolmaster, and from then Edward and Emma Du Val lived with their daughter and son-in-law. In 1901 they were living at Reigate in Surrey, then at Marlow in Buckinghamshire, and finally at Richmond in Surrey. By the time of the 1911 Census they were at Glen Rosa, Kew Road in Richmond, where Edward Du Val was described as a "tobacconist" and head of the household. He died at Richmond in 1923 aged 85 years. His wife Emma Du Val had died there in 1913 aged 71 years. Edith and Francis Sellicks had a son Leslie Edward Sellicks, who was born in Marlow in about 1903. He married Gladys M. Wheeler at Wycombe in 1934. They do not appear to have had any children. Emma Du Val died aged 70 in Richmond in 1913, and Edward James Du Val aged 85 in 1923. (1) Manchester Times 1 November 1884. (2) The Commercial Directory, and Shippers' Guide edited by R.E. Fulton 1871 edition page 296 and 1872 edition page 293. This firm is also mentioned in the Encyclopedia of Manchester Artists (Manchester Art Gallery) under the entry for "DUVAL, Edward James (fl 1872-1916)". (3) A drysalter was a supplier of paints, varnishes, dyes, gum arabic, glue, chalk, raw soap, and other unpackaged or dry chemical goods, as well as salt, saltpetre and other chemicals for preserving or pickling foodstuffs.